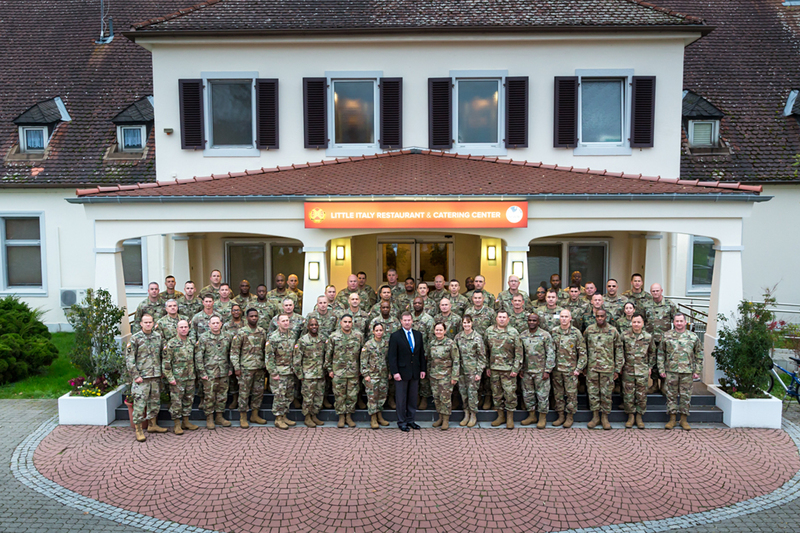 I had the honor of attending the United States Army Europe (USAREUR) Senior Enlisted Symposium in Wiesbaden, Germany, Nov. 15 – 17. The symposium was held in the Wiesbaden Mission Command Center (Truscott Room) in the USAREUR headquarters and hosted by Command Sgt. Maj. Sheryl Lion, the USAREUR command sergeant major. The two-day symposium principally served to bring all the senior enlisted leaders representing more than 75 commands and senior staff offices stretching from Mons, Belgium to Vicenza, Italy; from Baumholder, Germany to Zagan, Poland; and beyond, together in one place to participate in a series of briefings and discussions. The venue served as a great learning and teambuilding experience for these leaders to learn from each other and engage in intellectual discussions about the missions and opportunities of their respective and supporting organizations. Lt. Gen. Ben Hodges, USAREUR commander, welcomed all the participants and thanked them and their organizations and commands for the hundreds of operations, missions, engagements and partnerships successfully executed throughout the calendar year in support of operation Atlantic Resolve. Atlantic Resolve is a demonstration of continued U.S. commitment to collective security through a series of actions designed to reassure NATO allies and partners of America’s dedication to enduring peace and stability in the region – especially the Russian intervention in Ukraine in 2014. Amazingly, these multinational training and security cooperation activities are taking place across Eastern Europe in Estonia, Latvia, Lithuania, Poland, Romania, Bulgaria and Hungary. These activities improve interoperability, strengthen relationships and trust among allied armies, contribute to regional stability, and demonstrate the United States’ commitment to NATO. By comparison, the U.S. commitment to NATO during the Cold War, prior to the fall of the Iron Curtain, was 300,000 troops defending 175 miles of border along West Germany, East Germany and Czechoslovakia. Today, the U.S. commitment to NATO is 30,000 troops engaged in training exercises from Bulgaria in the south to Estonia in the north, a distance today of more than 1,800 miles. All the leaders at the symposium and their soldiers had a wealth of experiences, both fun and challenging, to share in the discussions over the two days. As I watched the participants in this symposium, a mix of leaders representing their commands and soldiers, some organizations assigned to USAREUR with soldiers and families stationed at one of a dozen military bases principally in Germany and Italy, I was impressed. Other participants in the symposium were leaders representing commands and soldiers deployed to USAREUR from stateside bases with families anxiously waiting their return. For all the participants, this symposium significantly helped to maintain situational awareness and understanding of ongoing changes throughout the Army and understanding how these changes impact their soldiers and their families. Lyon and the USAREUR staff did a magnificent job making these two days informative and inclusive for all the participants. Presentations included Fleet Command Master Chief Petty Officer Chris Addington, the European Command (EUCOM) senior enlisted leader who provided an overview of the EUCOM mission and commander’s intent. With a strategic view of 51 countries and independent states, Addington addressed the audience as contributing members of the team who are focused on strengthening strategic partnerships, building partner capacity, capability, and interoperability while ensuring ready and postured forces. Another key presentation was from Command Sgt. Maj. David Davenport, the Training and Doctrine Command (TRADOC) command sergeant major. Davenport provided a detailed and comprehensive presentation addressing the Noncommissioned Officer Professional Development System (NCOPDS). The Army’s professional development system for soldiers and noncommissioned officers encompasses institutional schools, operational assignments and broadening opportunities and distributed learning focused on self-development. The greatest takeaway from the TRADOC presentation was the transition from Structured Self-Development (SSD) to six levels of Distributed Leader Courses (DLC) beginning with auto enrollment upon completion of initial military training and each level of NCO professional military education (PME) course throughout a soldier’s career. DLC courses will focus on leader core competencies using the experiential learning model of adult learning. Once enrolled, the DLC course must be completed by the individual soldier prior to attending their next level of PME. DLC 1 is expected for delivery to the force beginning June 1, 2018, and each level of DLC after that is on an average of 4-month intervals. Other discussion topics included U.S. Army Sergeants Major Academy graduate assignments, training management education, improvements to the Basic Leadership Course (BLC), Army University, Army Career Tracker and the soldier’s Career Map, Master Gunner badge, and the new DA Form 1059 Academic Evaluation Report. The USAREUR Senior Enlisted Symposium for 2018 was a huge success for Command Sgt. Maj. Lyon, the command and the headquarters staff. We can all be proud of the Herculean efforts of America’s Army in Europe, our soldiers, Army civilians and their families, to support our strategic allies and foster peace and stability throughout the region. 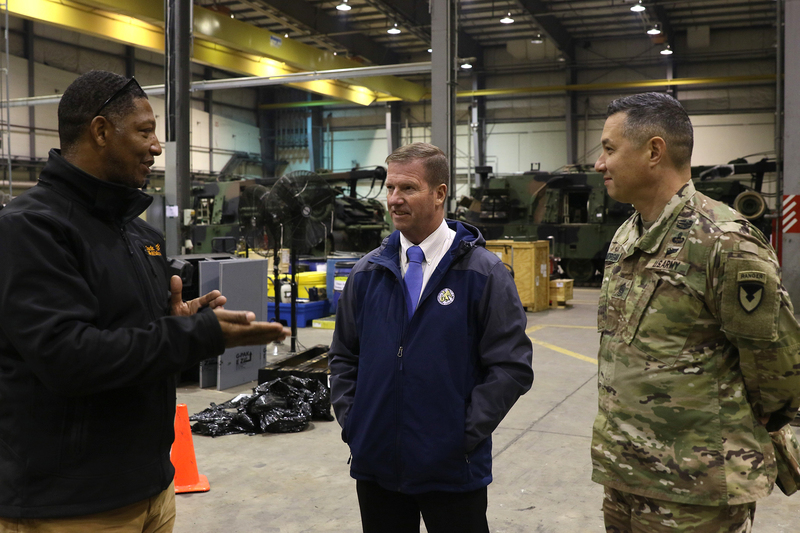 In addition to attending the symposium, I had the opportunity to visit with local AUSA chapters and support their efforts providing professional development and education in support of the military commands in their areas. It was great to get back and visit with soldiers and their families in Baumholder, Kaiserslautern and Wiesbaden again. I had the opportunity to tour Mannheim’s Coleman Barracks with John Galimore, the site manager, to see the ongoing efforts to support and sustain the European activity set equipment designed to support regionally aligned forces (RAF) focused in Europe. Retired Sgt. Maj. of the Army Ken Preston, center, and Command Sgt. Maj. Mark Morgan, right, are briefed by the site manager, John Galimore, at Mannheim Barracks. When the last M1A1 Abrams tank left Germany in 2013 as part of the Army-wide drawdown reducing Europe to 29,000 soldiers, this move marked the end of an era of forward-positioning heavy units in Europe. But, the 2014 Russian invasion of Crimea and the resurgence of a strong Russian military sparked concerns among NATO, Europe and U.S. interests, bringing tanks and all the associated heavy equipment back to Europe. The work in Mannheim is critical to supporting RAF units, not only on a rotational basis, but mostly during an emergency deployment to provide equipment sets to units needed in a threatened area of Europe. On the way to Mannheim, I stopped in the beautiful city of Nierstein to meet Konstantinos Guntrum, owner of the Louis Guntrum Winery, a Community Partner of AUSA’s Gen. Creighton Abrams Chapter. Historically, the site of the winery is where Gen. George Patton crossed the Rhein River in March 1945. A special thank you to retired Lt. Col. David Fulton, Abrams chapter president, and Eric Lien, European region president, for hosting and sponsoring my visit.